Alastair Seeley looked on course to become the all-time North West 200 record race winner after earning three pole positions in final practice. After topping the Superstock and Supersport sessions, Seeley, 36, took a dramatic Superbike pole as he finished 0.01mph ahead of Michael Dunlop. Seeley and Dunlop's late father Robert jointly hold the record with 15 wins. A rider had to be airlifted to hospital after sustaining what organisers said were "non-life threatening injuries." The incident at Mill Road roundabout led to the closing Superbike practice being ended some 30 minutes ahead of schedule. 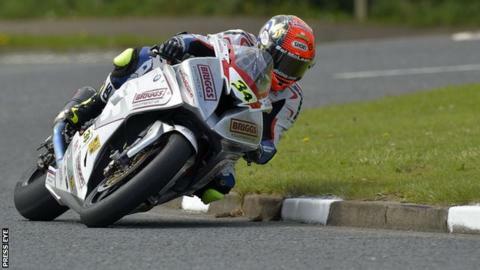 A statement from race organisers said that the rider had been taken to the Royal Victoria Hospital by air ambulance. English rider Dan Cooper was fastest in the Supertwin session ahead of Ryan Farquhar and Ivan Lintin. Carrickfergus man Seeley showed his intent with a stunning Superstock lap early in Thursday's session which was only 0.14mph slower than his later Superbike pole-clinching circuit. Record-chasing Seeley topped Supersport qualifying with a best lap of 116.97 which left him just ahead of Martin Jessopp (116.54) and Fermanagh rider Lee Johnston (116.47). William Dunlop, John McGuinness and Hickman completed the top six in the Supersport session with the highly-fancied Ian Hutchinson only managing 12th after having some bike problems. Thirteen-time North West 200 winner Rutter continued his impressive form to qualify third fastest with Johnston, Hickman and Hutchinson occupying fourth to sixth slots.